On a good day you can get from Odessa to Chişinău, the capital city of Moldova, in around four hours. On the day we chose to travel it took us over six. The road was rutted, pot-holed and covered with falling snow. 'Quality and Comfort' said a sticker on the side of the bus, but my seat was stuck in a permanent half-recline and the air was so cold that nobody took their hat or gloves off. The driver had a black leather cap pulled down low over his sunglasses, a cigarette in one hand and a mobile phone permanently wedged in the other. "When I was in India," began a loud North American voice from the very back of the bus. At the border there was nothing except brown, ice-coated puddles, an emaciated dog and a concrete toilet block, where we paid the equivalent of 18p to urinate down a skittle-shaped hole in the ground. Four men in combat fatigues and fur hats watched over the queue from the inside of a jeep. .....the largest transportation hub in Moldova. Chişinău's no Prague. The city was hit by an earthquake in 1940 and most of what was left standing was soon flattened by one or other of the German, Romanian or Soviet armies. We covered the sights in an afternoon: stone statues and glass casinos, rubble and squash courts where Moldova once held Scotland to a 1-1 draw, an Orthodox cathedral and a smallish arch built to celebrate a dead Tsar's victory over the Turks. We ended up watching the Premier League on a big screen in the Carlsberg Pub on Bucuresti, which had a nylon England flag hanging from the ceiling and a Tranmere Rovers fan at a table upstairs. Several beers later we decided it would be a good idea to attempt the forty-five minute walk back to the hotel. We only made it as far as the Hotel National before getting stopped by the police. "Passports," one said in Russian, sliding his leg out of the car door. As we handed them over disappointment slowly clouded his face. "Where are your girls?" he asked, changing tack. "What have you been drinking? Why aren't you drunk?" He closed the passports and put them in his pocket. "How about we go for a drink?" We laughed, nervously. "But you're driving, aren't you?" "Not tomorrow we're not," pointing at his partner, who'd got out of the car and was standing with his arms folded across his chest. "We're busy then." "Doing what?" "Erm, we're watching Zimbru against Otaci." He stared at each of us in turn, exchanged a look with his partner, and handed back the passports with only half a smile. It's no surprise they didn't fancy tagging along. You wouldn't have called FC Zimbru Chişinău versus Nistru Otaci the match of the day in Moldova, let alone the rest of Europe. Zimbru won eight of the first nine Divizia Naţională titles after Moldovan independence, before Sheriff, the second largest company in the breakaway territory of Transnistria, started bankrolling FC Sheriff Tiraspol. 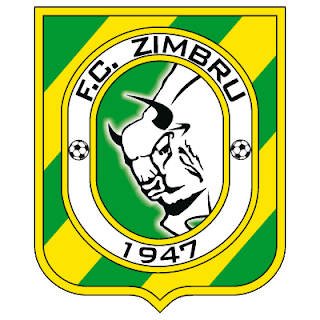 Zimbru hadn't managed as much as second place ever since and were way down in sixth before kick-off against Otaci, a small-town team from the far north of the country who were unsurprisingly bottom of the league. "You do know the game's on at the small ground?" asked the elderly woman who sold us our 10 Lei (50p) tickets. There was snow all over the new national stadium, so the game had been moved to a training pitch around the back. With an hour to go until the game kicked off we retreated to a sports bar just across the road. 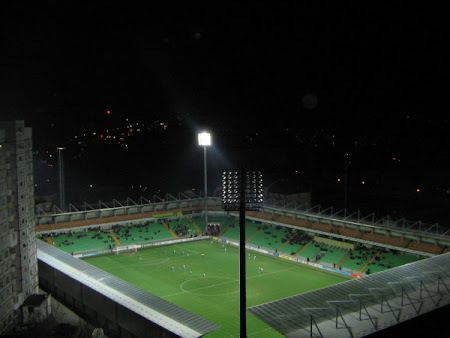 When we left, everyone else stayed behind to watch Rubin Kazan play CSKA Moscow in the Russian Super Cup. Snow joke. The Zimbru Stadium was covered in the stuff. (Nb snow not pictured). Several hundred flats overlooking the ground. Tick. There were only a few hundred people in the temporary stands and most of those who spoke English soon found their way towards our seats. "You will laugh when you hear how much these players earn," said a man in a ski hat and football boots who'd just grabbed my shoulder and told me to call him Victor. "Can you imagine only $400 a month? No, you can't! And do you see the man eight along on the bench? He was the top striker in 2008 but he likes women and casinos too much." "Who's the best player now?" we asked, and two people behind us laughed out loud in reply. As Otaci had travelled without a goalkeeper, a reserve defender had been forced to play there instead. The top he'd been given was at least one size too big, his gloves were so small he took them off before half time and whenever he made a save the crowd burst out laughing while Zimbru's players stomped on the ground in disgust. "He was playing in the first team before," Victor told me, "but then they bought the two Africans. They're here for three games. It's a kind of corruption." Neither of the foreigners was half as good as Zimbru's number nine. "Who's he?" I asked Victor. "Nobody." There wasn't much of an atmosphere beyond a few dozen fans chanting 'Zim-bru Ki-shi-nau, Zimbru Ki-shi-nau' on the other side of the pitch. By half-time even they'd got bored and started throwing snowballs at each other instead. Deciding against Victor's offer of lemon tea and half a slice of processed cheese, I spent the interval in the toilets attempting to ward off frostbite with the aid of a malfunctioning hand-dryer. A lemon tea and half a slice of processed cheese please treacle. Two-one up at the break, Zimbru finally brought on their casino-loving striker midway through the second half. He jogged around for a few minutes, did nothing at all for the next twenty, and then scored with a tap-in right on full-time. Zimbru's third goal had come five minutes earlier, by which time half the crowd, including Victor, had already left. "Moldovan football," he laughed. "Once is enough." You can follow both European Football Weekends and Michael Hudson on Twitter. For more of Michael's work head over to the excellent Accidental Groundhopper Blog. Isn't the stadium in Tiraspol relatively swanky? and do Moldova still play games there? - despite it being part of the breakaway state? Yours puzzled over ex-Soviet and CIS balkanization. That link doesn't work?? My own blog contains an article on the malafide FC Sheriff and Transistria too. Transnistria is basically a sort of USSR remainder, lot of propaganda from the old regime still on the walls. I would love to visit it myself. It is de facto sovereign but unrecognised by any other nation. PS: forgot the URL of my blog. http://thepathslesstravelled.wordpress.com ; then the Sheriff Tiraspol article is somewhere in August or September 2010 posts. Don't worry, having lived in Latvia, the Czech Republic and Odessa (and being a bit of a leftie myself) I understand that last comment perfectly. IBWM changed their site a few months ago but you can access the article through Mark Gilbey's page at the new inbedwithmaradona.com. There's also a photo journal in their gallery section. You can get to Tiraspol by bus or taxi from Odessa. It depends how they're feeling at the border whether you get their with all the cash you started with. Or, indeed, at all.